Each selected participant will have to deposit 380€ through Bank Transfer (IBAN / SWIFT), or via Western Union or similar (we do not accept Paypal transfers). The amount covers for all daily expenses, accommodation and access to all activities at the Summer Camp including the materials for the Microphone Workshop and the rest of activities. Audiotalaia Summer Camp is a workshop, a residency and a collective experience centred around creativity, sound and technology. The meeting looks after shaping a creative practice focused on sound and driven by a collective workflow. The Summer Camp joins every summer since 2016, young and creative people involved in the fields of fine arts, music, design, architecture, photography, filmmaking, etc. The goal is to assemble a group of unique and diverse individuals that aim to integrate sound into their personal creative processes, from a wide variety of disciplines, cultures and backgrounds. Audiotalaia Summer Camp is a creative meeting in which the sound, the technology and the landscape are being approached in several creative processes along nine days. The whole program has been designed to focus attention and efforts on the practical aspect of a learning process. Theoretical and conceptual side of the artistic practice will be spread across feedback sessions, open debates and daily workflow. The stay is divided in two main stages: the first is focused on building a collaborative framework through tutored and daily projects tackling various formats within the sound art practice with a strong focus on process, feedback and collective debate. The second part of the camp focuses on development of a series of projects in which participants will have to collectively shape installations, concerts and performances that will be presented during a final event open to local audiences and general public. All activities during the camp will revolve around aspects such as listening experiences, composition, field recordings, installation, sound sculptures, site-specific interventions, live performances among others. Summer camp is a collective and living together experience. This means that participants will share various rooms with bunks or beds and common spaces. The creative and experimental tasks are combined with several daily routines in which the group will work as a team. This stay is a process of immersion and intensive work: a week to work, learn and share collectively. 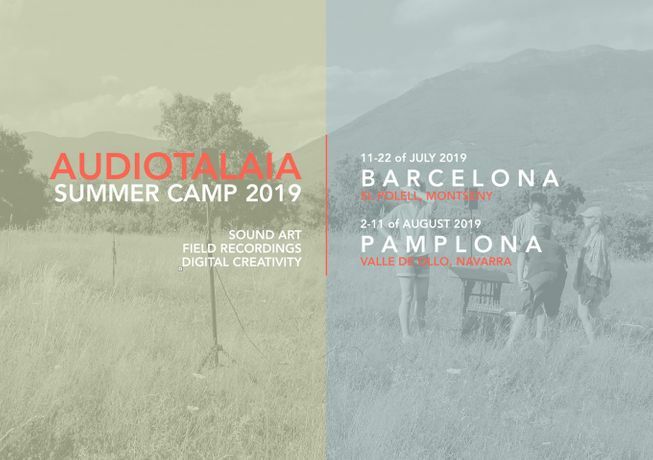 Audiotalaia Summer Camp is an initiative lead by musician, producer and sound artist Edu Comelles with the help and support of Balbina Sardà. Alberg Rural El Polell and Ur Tanta. The first camp will happen between the 11th and the 22nd of July 2019 at El Polell a house in the middle of a natural reserve nearby Barcelona (Catalonia). The second camp will happen between the 2nd and the 11th of August 2019 at Ur Tanta a house outside Pamplona (Northern Spain) surrounded by a high mountain rural landscape. Both houses have been carefully selected by the organisation because of their similarities, surroundings and the strong involvement of the hosts on local communities and the social development of their respective vicinities. Both camps will be organised in the exact same way and offer almost the same program, opportunities, environment and context. The activities, materials and possibilities are the same in each place. Participants who apply for the summer camp can choose between one of the two options: El Polell or Ur Tanta. Alternatively you can let us decide for you and we will locate you according to places available in each house. The first part of the camp will be focused on training our collective skills through a series of daily activities or projects. Every morning a theme and a format will be stablished and 5 different groups will have to work towards a final presentation happening at night. Each collective process will be tutored and status meetings will allow for collective feedback and debate. The second stage of the Summer Camp will be dedicated to development, production and rehearsing of the final presentations taking place the last evening of the Camp. During this last days, the participants must create, plan and finish a work done collectively. During the entire camp different materials, human and technical resources will be provided in order to deliver the works, and also to get them ready to be shown to the public. Extensive monitoring, guidance and tutoring will take place on all stages by groups and the tutor. The organisation, over the years, have been stashing a wide variety of materials at the disposal of the participants. Those range from studio monitor speakers, a PA System with sub-woofer, a range of wireless speakers, microphones, portable recorders, headphones among other audio gear. Within all the above, specific times will be stablished to present personal projects, show ideas, organise improv sessions. Also, during the first day a DiY Microphone Workshop will provide participants with a handy microphone kit (Contact and Binaural Microphones). The stay has been designed to take place in an intensive and collective experience at each of the facilities. Both houses have shared rooms that range from 4 to 5 beds each and some bulk beds. Both houses are equipped with kitchen and common areas, living room and workshop as well as outdoor open spaces. This 9 days stay at the Audiotalaia Summer Camp implies a certain level of compromise from the participants. Each of the 15 selected individuals will be split in teams and each of them will have assigned daily tasks. Those include, cooking, tiding up the house and cleaning. The tasks will be given through a schedule that will establish a proportional amount of work for each of the 3 groups. The participation includes the acceptance for part of the participants to collaborate daily with the basic tasks described above. The Camps aim to gather young talented people from all over the world interested on sound and its creative possibilities. We are looking for individuals aiming to share and work collectively. Common language in the Summer Camp is English. A good level of spoken English is required to attend the camp and interact in all activities. We are looking after fine arts students, visual or sound artists, musicians, performers, photographers, architects, anthropologists, documentarists, filmmakers, video artists, designers or just people interested on using sound in their creative processes. We are strongly encouraging people involved in sensory ethnography, anthropology or geography, as well as architects or students of architecture engaged on the study of landscape from an open perspective. Over the years a number of participants have arranged by themselves financial support from public institutions, local governments, etc.. covering travel and registration fees. We strongly recommend to look after this kind of financing. The organisation of the summer camp will help in any way possible to do so, by signing letters of invitation or acceptance and submitting required documentation. We highly recommend to EU members to apply to the Step Beyond / Creative Europe grants, which have been widely used in previous editions of the camp. Each of the participants will have to travel by their own to Sant Celoni (Barcelona) or Pamplona depending on the camp you apply for. In each city a meeting point will be stablished and transportation will be provided by the organisation to the respective houses. The same operation will be repeated at the end of each camp. Once selected, the Audiotalaia Team will instruct you and advise on how to get to the camp and what are your best combinations available. Open Call will be open between the 26th of February until the 1st of April. The registration to the Summer Camp has two main steps: First each individual will have to fill the online form linked below. The Open Call form will provide us with background information on you. You will have to send a short motivation letter and minor information on your background and interests. During registration you will have to choose between one of the two Camps or leave that decision to the organisation. On the second stage we will carefully read and evaluate your candidacy in order to determine if you fit the profile. Once we close the open call we will select the best candidates to be part of the Summer Camp 2018. Notification via email will be sent to all applicants and the selected ones. Further instructions to the chosen will be sent at that stage. Each house can host up to 15 participants at each facility. This means that once the registration of the applicants is done, 30 profiles divided between July and August will be selected and a list of pre-selected will be kept just in case there are last minute drops. Open from February 26th until April 1st. Between the 5th and the 10th of April. Two to three weeks prior to the Camp starting date. Between the 12th and the 21st of July.